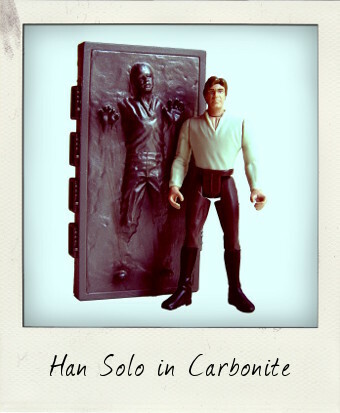 Han Solo in Carbonite with Carbonite Block! While my love affair with vintage Kenner Star Wars action figures burns ever strong, I confess to the odd flirtation with newer figures from the Neo-classic era (1990–2000) when they are particularly good. I'm not a huge fan of Hasbro’s 1990s Star Wars revamp (rather unimaginatively named Power of the Force 2 to distinguish it from the earlier 1980s Power of the Force series, famous for its cardbacks with special collector's coins), but one simply can’t have too many Han Solo action figures! I was thrilled to dig out this 1996 figure from a bargain bin the other day. 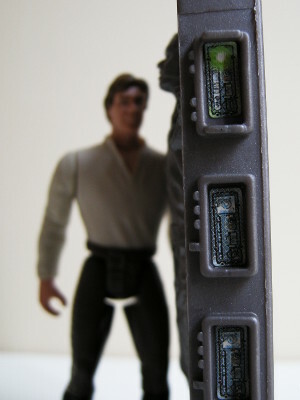 I’ve seen a few of these loose Hans around before, but luckily this one was neatly clipped into his Carbonite Block accessory. He may have lost his blaster weapon, but with such a brilliant, movie-accurate Han-in-Carbonite sculpt, this slight loss is of very little importance. The figures in this line have more exaggerated, muscular proportions compared to vintage era figures – I’ve never liked these bulky upper torsos, petering down to smallish waists much – although some great progress has clearly been made with the facial likenesses. This Han does bear a passing resemblance to Harrison Ford as he appeared in The Empire Strikes Back – certainly his hairstyle is correct, as are the other details such as the broken yellow line of his Corellian Bloodstripes on his trousers, although a little more effort might have been made to get the shirt right, with its distinctive wrap across buttoning, which Kenner got spot on with its earlier version of the figure. 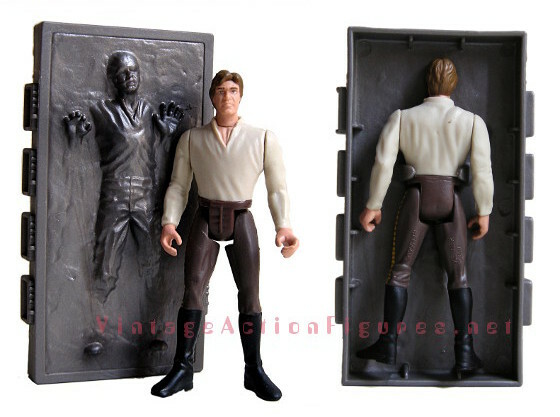 The best part of this edition surely isn’t the figure itself, however, but instead the stunning Carbonite Block accessory complete with decals, which allowed kids to re-stage the moment when our rebel hero is deep frozen in carbonite and carted away by bounty hunter Boba Fett for delivery to Jabba the Hutt. Superbly detailed and allowing the figure to stow away neatly inside it thanks to the indented back of the casing, Hasbro did an excellent job here. Incidentally, the legendary Kenner name still appears on the figure. Although the company was bought-out – first by Tonka in 1987, and again by Hasbro in 1991 - all POTF2 figures were still marked “Kenner” until 1999. This one is marked “KENNER” and “CHINA” running upwards on two lines on the back of his right leg, with “© 1996 LFL” on one line on his left. This is hands down my favourite Power of the Force 2 figure and great vintage find!